Daryl Peach was born on 8th March 1972 in Castleford UK. At the age of 14, his parents moved to Lancashire where he lives today in Blackpool. He is often referred to by the nickname: 'Razzle Dazzle' or 'The Dazzler'. At first, Daryl achieved moderate success as a snooker professional but eventually he became disillusioned by it, having not managed to break into the highest level of the game. He found it hard to make a living from snooker alone and it was after his friend Joe Walsh talked him into entering a 9 ball pool tournament - and he won it - that Peach quit snooker and decided to devote his talents to 9 ball pool. 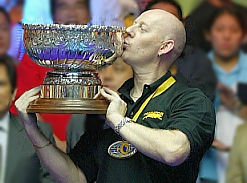 By far, Daryl Peach's greatest achievement in his 9 ball pool playing career to date is winning the 2007 World 9 ball Pool Championships in the Philippines.